Film mahurats seem to be making a comeback in Bollywood. After Double Dhamaal, we went on the sets of Rajkumar Santoshi's new film, Power. Like its title, the film has a powerful cast as well - with Amitabh Bachchan, Anil Kapoor, Sanjay Dutt, Ajay Devgn, Ameesha Patel and Lekha Washington. The mahurat clap was given by Minister of State Information Technology and Communications Gurudas Kamat. Santoshi directed the shot while filmmaker Prakash Jha took over the camera. 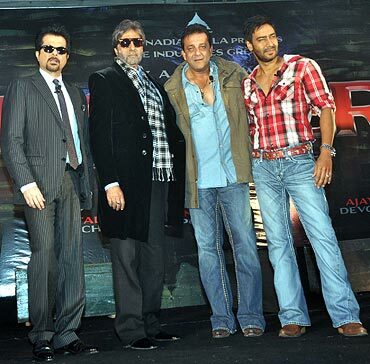 The shot introduced the film's main characters: Bachchan, Kapoor, Dutt and Devgn. Kapoor dons a negative character while the other three seem to be out to destroy him. Devgn, who was on paternity leave, is back in action with this film. The shooting of Power will begin on October 4. It will be shot in Mumbai, Bhopal, Muscat and Dubai. Getting the cast together was quite easy, Santoshi tells us. "I just gave them the basic storyline. I did not have the script yet, but even then, all of them said yes to me," he said. Though Santoshi has worked with Bachchan and Devgn in Khakee before, he will work with Dutt for the first time in Power. "I had heard a lot of scary stories from people about Sanjay Dutt but I am sure Sanjay won't scare me," he laughed. Anil Kapoor spoke at length about his co-stars, and claimed that Amitabh has been his inspiration right from his struggling days. He also narrated a story about his struggling days when he was trying to bag a role. When Sanjay Dutt got a break in Rocky, Kapoor went on the sets of the film to ask for a small role - like Rocky's friend. But he could not land it. "But today, Sanjay Dutt and I are close friends," Kapoor smiled. They recently worked together in Kapoor's home production, No Problem.